The Age of Sigmar is upon us and with it the start of a brand new line of novels from Black Library. 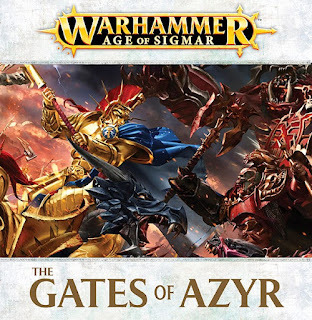 Eager to delve into the new lore I picked up The Gates of Azyr by Chris Wraight on release day, so how did it fare? First things first, this book is actually a novella, and not a full length novel. This is a little disappointing considering it's what's kick starting a whole new world for Black Library. You would think they would want to start with a bang, but considering this is a tie in novel to the starter set it's not a huge surprise. Every other starter set book has been a novella as well. I usually stay away from the novella's since the average price is $24 for a quarter of the content of a normal novel, which is also usually $24 - $30 for the hardback. The Gates of Azyr comes in at a fairly reasonable $15 though, so no complaints from me there. The book itself is 120 pages long, which is also a little thicker then their normal novellas, but it is a bit deceiving. The paper they used for the pages is extremely thick, almost excessively so. While this doesn't affect the story length, it does make the novella look larger on a shelf and probably cost them a bit more to do as well. The other issue I quickly ran into is that the beginning of each chapter had three "blank" pages. That is to say one blank page, then the title page for that chapter, then another blank page, and finally the actual start of the chapter. There are eight chapters in the book, so when you take that into account the actual story length is 96 pages, that's a lot of wasted space. Now on to the story itself. It opens up with Vandus Hammerhand preparing his Stormhost for the immenant invasion of the Realm of Fire. We get to see inside his head a little here, and I wish more time had been spent on it. The Stormcast Eternals are still somewhat of a mystery, even after the big book. I'm sure this is being done on purpose so they can reveal more about them as the game progresses, but my thirst for knowledge on them demands more. After that first chapter we are taken into the Realm of Fire itself before the invasion. There we get the view points of a Bloodreaver on the hunt for some of the remaining refugees in the realm, as well as the view point of the refugees themselves. It sounds like any remaining humans are pretty much surviving in semi-nomadic tribes as they evade the Chaos forces, at least in the parts of the realms we are shown. One thing I did notice is that it seems like GW is switching from everything having a Germanic sounding name to more Sweedish sounding, with one of our refugees being named Sven. It makes sense considering the overall Nordic theme to the new mythology. After a couple of chapters of the forces of Chaos interacting with each other as Khorgos Khul and his warband assimilate the Bloodreavers into their forces, we get the actual assault by the Eternals. The description of being hurtled through the void in Sigmar's lightning strikes is pretty interesting and is yet another thing I would like to see expanded upon in the future. The battle itself is a battle, not much to say there. It has it's interesting moments such as the Prosecutors attempting to open the gate, Ionus Cryptborn holding the line and a few other moments. It's handled fairly well, but I'm always more interested in the characters then the action. Again we get a few more glimpses at what exactly the Stormcast Eternals are. They are somewhat similar to Space Marines in the fact that they are giant, superhuman warriors. Worst of all they do use the word "brothers" a lot, which to me is pretty Space Mariney. Luckily they never call each other Battle-Brothers or anything like that. That's where the similarities end though, as they still retain a lot more of their humanity when compared to Marines. They can still feel love, fear, and the whole range of emotions. They understand regular humans and what it means to be human. They are just more brave and martial due to the fact that they are now literally demigods who cannot ever truly die. There is a scene where one of the Eternals removes his mask to show a human that he is in fact, also human. She seems comforted by it and reassured, but they don't really describe his face that much. I am still convinced there is a reason none of the Eternal models have a bare head. There is something fishy there and I can't wait to find out what it is. The Gates of Azyr started a lot of threads that I am interested to follow. Vandus Hammerhand is definitely interesting, as is Ionus. My current theory on Ionus is that he is Vlad brought back as an Eternal. Read through the novella and the rulebooks and let me know what you thing on him. There is a ton of room to expand and GW has done a pretty good job at peaking your interest here to make sure you stick around for the ride. I wish this novella on it's own had more to offer though. It's pretty much just one giant battle with a few character moments here and there. If they had doubled the story length I think it would have given Chris Wraight the room he needed to flesh things out a bit. In the end $15 isn't bad, but if you can get it for $10 I think that would be the ideal price.